The Flathead National Forest, in coordination and partnership with Glacier National Park, has begun the process to prepare a Comprehensive River Management Plan (CRMP) for the 3-Forks of the Flathead River. Project activities will include reviewing the existing Flathead River Wild and Scenic River Recreation Management Direction and River Management Plan. The river and surrounding lands offer recreational opportunities and access to outstanding resources for a variety of public lands users. The CRMP will address the current status of these resources, outline goals and desired conditions, determine user capacities, and create a monitoring strategy and plan to carry forward. The public is encouraged to contribute to this planning effort that will secure the outstanding remarkable values of the 3-Forks of the Flathead River for future generations. The planning team is interested in diverse stakeholder input as we develop the CRMP. A series of resource-focused public meetings are being held beginning with the first meeting in May. Our upcoming meeting on Wednesday, July 25, will focus on ethnographic and historical resources monitoring, management, and concerns as part of the efforts to develop the CRMP. The meeting will be held at the Forest Supervisor’s Office at 650 Wolfpack Way in Kalispell. The main meeting will be from 6 pm to 8 pm and will include presentations on current ethnographic and historical information and some facilitated discussion on how ethnographic and historical resources will be addressed in the CRMP. An introductory presentation on the Wild and Scenic Rivers Act for those new to the CRMP process will begin at 5:45pm. Future meeting topics, links to past meeting materials, and the meeting schedule are posted on the CRMP website. The 3-Forks of the Flathead was designated a Wild and Scenic River on October 12, 1976 and is a component of the National Wild and Scenic Rivers System. It encompasses the North Fork of the Flathead from the Canadian border to its confluence with the Middle Fork, the entire Middle Fork, and the South Fork from its headwaters to Hungry Horse Reservoir. The North Fork and the lower Middle Fork form the boundaries between the Flathead National Forest and Glacier National Park. Portions of the Middle and South Forks flow through the Bob Marshall and Great Bear Wilderness Areas. 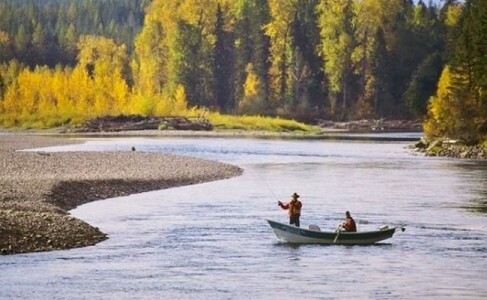 A total of 219 miles of the Flathead River are included in the designation.